An electric power transmission line in Crimea. The conflict over energy between the countries continues. Russia has decided not to renew a contract on electricity supplies to Ukraine after refusing to buy Ukrainian electricity for Crimea. Thus, another important tie in Russian-Ukrainian relations has ceased to exist. So far, Ukraine has had no problems getting through the cold season; it almost stopped buying Russian electricity as early as November of 2015. But in the case of prolonged cold weather or disruptions in the supply of coal, the country will face electricity blackouts again. “The Russian Federation is not negotiating for the supply of electricity from Russia to Ukraine,” the Russian Ministry of Energy confirmed. "We will not extend it, as it was originally linked to the contract for the supply of electricity from Ukraine to Crimea." In 2014, Ukraine purchased electricity from the Russian power grid under a contract between Russia's Inter RAO and Ukrinterenergo, which was valid until the end of 2015. At the same time, a contract was concluded for the supply of electricity from Ukraine to Crimea. Technically, it is not related to the export contract between Russia and Ukraine. After a series of sabotage incidents on Ukrainian power lines in fall, Crimea found itself in an energy blockade, which was alleviated after the launch of an energy bridge from the Kerch Peninsula. 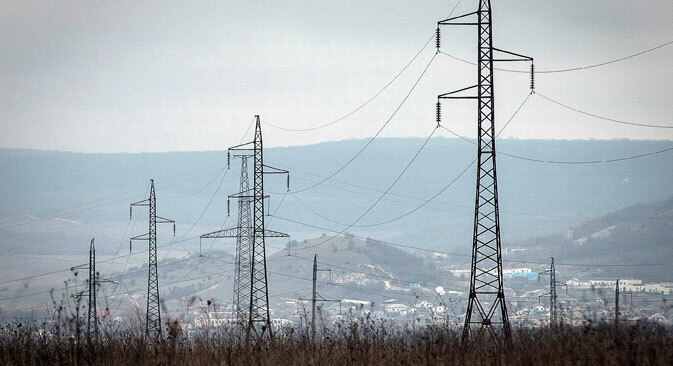 Although Ukraine partially restored its electricity supplies to Crimea in December, an attempt to conclude a contract for the supply to the peninsula in 2016 failed. This was because Kiev demanded that Crimea be recognized as Ukrainian territory, which was unacceptable to Moscow. According to a telephone poll in Crimea carried out on December 31 and January 1, 94 percent of respondents were willing to accept possible power outages during the next 3-4 months until the second phase of construction of the energy bridge across the Kerch Strait is completed (it is set to be launched on May 1). After the poll, the Russian government also decided not to raise the issue of extending the contract for the export of electricity to Ukraine, said Kommersant's source in the industry. Meanwhile, the agreement on the parallel operation of the power grids, according to which power overflows will be paid for in emergency situations, will stay in effect. But the volume of these overflows tends to be small. In the past year, Ukraine was trying to minimize purchases from Russia and used this option only in cases of a substantial energy deficit. The largest volumes of supplies in 2015 were seen in January-April, at the height of the coal crisis in Ukraine, which coincided with numerous repairs of power equipment. Ukrainian Prime Minister Arseniy Yatsenyuk said on January 10 that his country has enough coal in stock and does not expect power outages.